A 35-year-old man went to his physician with complaints of bloating, intermittent diarrhea, and abdominal cramping. He stated that, he liked to go camping and hunting and sometimes consumed the fish and game that he caught. The man was asked to provide a stool specimen for testing. The laboratory that performed the testing made a wet mount after using a concentration procedure. The images below show what was observed in low numbers on the slide. The objects ranged in size from 45 to 58 micrometers in diameter. What is your diagnosis? & Based on what criteria? Enter your answers in the Comments Section. Correct answers and names of winners will appear on 22nd December,08. 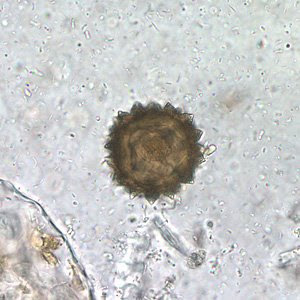 Answer: It is not Helminth eggs (Neither Ascaris nor Taenia eggs), becoz it has regular angular spinous process. 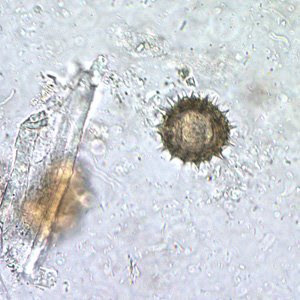 The given image is Trichodina sp.Saucer shaped parasite.Trichodina is a ciliated, protozoan parasite of fish gills and skin. Under the microscope, these organisms look like tiny, rotating, ciliated discs.